Since the launch of Slack, people have asked for a way to “fave” or “like” messages — a simple, public way to acknowledge or approve a message. We already had the ability to star messages, (which is useful for creating personal reminders and quick to-do lists, but isn’t visible, or intended for communal use). But we knew that if people wanted something for showing appreciation that everyone else could see, we really needed something else. We feel confident in saying that the feature we’re rolling this morning is pretty much the epitome of “something else”. We argued about what symbol we would use — a heart, a star, a thumbs-up, a check-mark. But then we realized that all these were already in the default emoji set… along with the dancers, the sparkles, the monkeys, the smiling, crying, grimacing faces, and the poop. And after months of testing, we’re pretty sure it’ll change how you use Slack. Sure, you can use this to “like” messages, as so many people have requested. But there are many other uses. These are just a few we’ve discovered on our own team. You can use the obvious “thumbs up or thumbs down”, or get more creative. Want to set something up, but not sure how many of the team are on board? Just add a + as a reaction to your own message, and the number next to it will climb as people add their assent. You get on with your day and let us do the math for you! Treat yo’ self! Does something deserve applause? Give it some. Since you can add custom emoji, you could even add an animated gif of applause. Or fireworks. Or whatever. Everyone deserves a warm greeting on their first day. Now it’s easier to avoid a wall of welcomes or the anguish of trying to find a totally new and original way of saying “Hi!” — a simple wave can do much the same thing. When good news hits a Slack channel, it’s important to add your message of support to a chorus, but on a large team that can amount to a whole lot of messages. 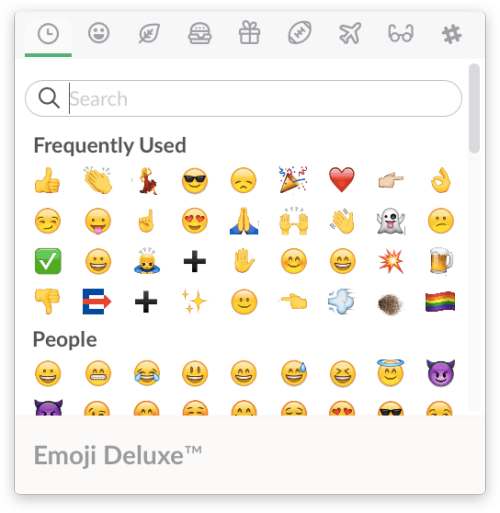 With reactions, you can express your joy with an ever-increasing number of emoji in a tidy way. Want to report back quickly to a request? Add a tick. A big green tick. And then maybe the requester will add a happy face. And also a big thumbs up because you did a good job. And then you could add a blushing face. Look, we don’t want to legislate the whole conversation, but the point is: the possibilities are almost endless. (Or actually endless, depending on how many custom emoji your team like to add). To make this new feature easy to use and emoji better (and frankly more logical) everywhere else in the app, we’ve also revamped the emoji picker. No longer will you wonder why hand gestures used to be under the “rat” tab, instead you’ll find simpler categories, that are also scrollable (and searchable) letting you find exactly what you’re looking for with far less effort. In addition to the reactions on messages and files, AND the new emoji picker, we’ve updated the Recent Mentions tab in the top right corner to also include reactions, so you can review any new reactions added to things you’ve posted all over Slack, in one place. Slack will even alert you to new reactions by changing the @ symbol in the button to the recent reaction’s emoji. Or, at the very least, really quite good technology.